I got my first kill for a while no idea what species a bit over two foot long but very thin it was in a small bush my only weapon was a pair of tin snips first attempt cut in in half the second I was able to remove the head no real distinct markings light colored underbelly black back. our land is a veritable snake superhighway with snakes regularly transiting from a 5 rai overgrown field on one side to a rather swampy area (read lots of frogs) on the other side. Our dogs are the guardians of the property and brook no intruder vermin be it snakes, rats, mice or large toads.. Two of our three dogs, one a terrier type and one a "Maa Thai" of red color are very fast and team up to engage any snakes. The terrier got sprayed in the eye by a spitting cobra about two weeks ago. When we noted his shut eye I pried it open to see a mass of puss and inflammation. I rinsed it out with a bottle of sterile water and for good measure got the red dog too since one of his eyes was a bit weepy. We took the terrier to the Vet who administered two types of anti-inflammatory eye drops and gave him a antibiotic shot for good measure. When we got home from the Vet we searched around the house finding a large patch of blood on the driveway and nearby the very dead, very chewed up Cobra which was about 3 feet long but quite hefty..
Aside from seeing snakes when the dogs do battle with them, I very rarely see them when I'm working in the yard. No doubt they are there, but stay out of my way. In the last two months I'd say the dogs have taken on at least 8 snakes that I know of, killing most with a few getting away... 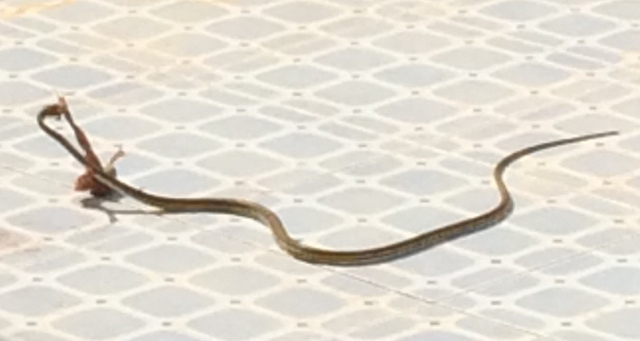 The largest was about 2.5 meters long and probably was non-poisonous although the Red Dog (Tiny is his name) can be seen with the snake striking but I could find no wound later..
You have a really good team there. Once you hear the frogs croaking keep an eye out. Occasionally in the paddies adjacent to our land you'll hear the death croak of the frogs once they are captured and devoured in the rice. And sometimes at the front door. Saddle up with some popcorn for your viewing pleasure! I was woken at midnight (seemingly nobody else!) with the dogs barking outside. Fairly sure the identification of a banded krait, juvenile it seems as only about 60 cms long. It didn't seem aggressive, indeed seemed to curl up as the dogs nudged around it. I thought black/yellow, the wife this am thought black/white. Reading up, it seems these kraits have more deadly venom than cobras, so in retrospect, pleased to have my lengthy bamboo pole. At least with the markings, they can be spotted easily. A cold night, perhaps more so to me, stumbling around in just my shorts. The lady who sell clothes at Boh-Bae went go to the grilled chicken place with her 4 year old daughter. Then her daughter need to pee, so she took the girl to the back of the food shop next from the canal, then the girl said "mommy..snake! ", so she took her daughter up n run away..then tell the owner so they call emergency service to take it away. Wow, only a kilometre from us. A snake has been getting the dogs worked up every few days over the past couple of weeks. I've seen it in attack mode trying to strike one of the dogs from within the bushes once and heard what I thought was a tail rattle but could have just been it rustling the leaves. Anyway today finally spotted it coming through the gate and into the bushes. Had some in-laws at the house so they chased it across the road and into a drain. Any ideas what it is as no doubt it will be back. Was around 1 pm when I saw it. Always thought snakes preferred coming out at dusk and night? I killed one that looks similar yesterday about lunchtime my Shepherd rounded it up by the time I got there it was up in strike mode I think it may come out of the tree's and was on a concrete pad I got lucky one shot with the shovel and took it's head off. Keelback, one of those, and almost harmless. Classified as no danger, but always small kids and elderly should be aware. Getting an infection or blood poisoning from non-venomous snake can be as fatal as almost dry bite from venomous snake. As you can see, snake plays to be a cobra and it is the way to defend. Some Thais think that it is real cobra. If you ask from them, some say that it is cobra. Most say that harmless fish-eating snake. Thanks eagle. Appreciate the info.